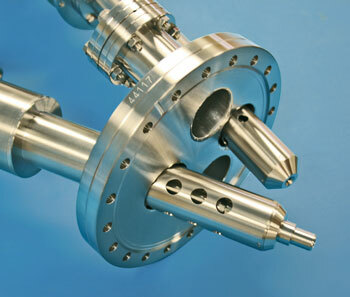 (Nanowerk News) The Hiden EQS-series of quadrupole mass spectrometer probes were introduced for measurement of external ions in a vacuum environment, specifically for application to the SIMS surface analysis technique. The systems are now even further enhanced by the addition of a new high-efficiency electron bombardment ion source mounted at the immediate entry region to the probe for direct measurement of secondary neutrals(SNMS), enabling quantification of concentration over the full abundance range from trace level to 100%. The dual techniques are beneficial for diverse surface analyses including measurement of optical and metallurgical coatings, alloys, corrosion layers, architectural coatings. Both SIMS and SNMS can be used throughout a continuous measurement sequence to provide quantified depth profiling data through the widest concentration range. The probes combine both mass and energy filters for optimum beam transmission efficiency together with refined mass resolution and abundance sensitivity, with mass range options selectable up to 2500amu. They are available with both gas and metal-sourced ion guns to enable SIMS/SNMS upgrade of existing surface analysis facilities, and alternatively as complete standalone SIMS/SNMS Workstations. For further information on this or other Hiden products please contact Hiden Analytical at [email protected] or visit the main website at www.HidenAnalytical.com.